Recovery Explorer RAID is your best bet if you encountered data loss from any type of RAID, whether hardware or software, or a RAID-based device, like NAS. The software handles RAID arrays of standard and nested levels as well as custom RAID configurations. The user-friendly interface of the program makes the recovery procedure simple and straightforward even for those lacking technical background. Moreover, the application allows to work with any other stand-alone storage medium with the same efficiency while a set of additional tools will aid you in the process helping to achieve the desired result with much less effort and time spent. 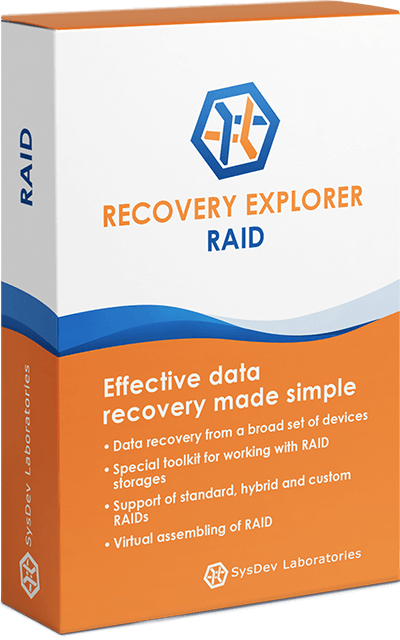 Recovery Explorer RAID is aimed at providing the general public with lucid and exceptionally convenient to use means for professional-quality data recovery. If you’re an expert in this field, you might be interested in a more specialist-oriented software – UFS Explorer RAID Recovery. Learn about the difference between these products and choose the one which perfectly meets your individual data recovery needs. Support of most popular standard RAID patterns for RAID 0, RAID 3, RAID 5, RAID 6, RAID 7, etc.